Analysis: The president's itinerary has been largely limited to Republican parts of Republican-leaning states and districts to help loyal Republicans. WASHINGTON — President Donald Trump is hardly setting foot in competitive political territory, much less places he lost in 2016, as he barnstorms the country on behalf of Republican candidates before next month's midterm elections. Only two of the dozen "Make America Great Again" rallies he's held since Labor Day have been in counties he lost in the presidential race — Clark County, Nevada, and Olmstead County, Minnesota, according to an NBC News analysis. Trump's average margin of victory in the counties he's campaigned in, including the pair he dropped to Hillary Clinton, is more than 20 points — 57 percent to 36 percent — and includes five counties he won with more than 60 percent of the vote, according to a review of data compiled by Dave Leip's Atlas of U.S. Elections. Are Trump's rallies losing their MAGA magic? 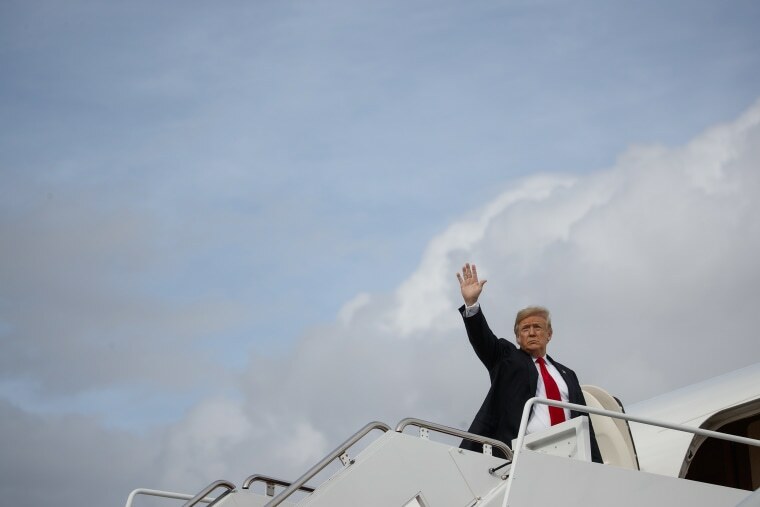 The president's itinerary so far has taken him largely to heavily Republican parts of GOP-leaning states and districts to help Republicans who are loyal to his cause. At the rallies, he offers red meat to supporters in the hopes of ensuring that they will show up to the polls on Nov. 6 even though his name isn't on the ballot. His choice of locations indicates a reluctance to make his case beyond his Republican base. It also suggests that he can be more helpful to Republicans in tight House races by getting close enough to their districts that his most avid supporters can attend the rallies but far enough away that he won't attract as much attention from Democrats. "His strength is in areas of low-density population," said former Rep. Tom Davis, R-Va., who headed the National Republican Congressional Committee during the 2000 and 2002 election cycles. "These are low turnout areas traditionally, but elected Trump. They need to keep him out of wealthy urban and suburban areas." The Trump campaign referred NBC News to the White House for questions about the president's political travel, and the White House did not respond to an interview request. But David Wasserman, the House editor for the nonpartisan Cook Political Report, said Trump's jam-packed schedule demonstrates that he still has tremendous value to the GOP in certain races. "It says that unlike 2006, when there were virtually no districts George W. Bush was helpful to Republicans, there still are plenty of places where Trump can help gin up Republican enthusiasm and try to limit Republicans' House losses," said Wasserman, an NBC News contributor/senior analyst with the NBC Election Unit. Last week, the president went to Erie County, Pennsylvania, a storied spot in Trump lore because he won there by about 2,000 votes after President Barack Obama defeated Mitt Romney by about 19,000 votes in 2012. Erie County provided both a piece of Trump's 44,000-vote margin in pivotal Pennsylvania and a wow factor for political observers, because it was the first time since President Ronald Reagan's 1984 re-election romp that a Republican had won there. Trump campaigned on behalf of Republican Senate candidate Lou Barletta, gubernatorial candidate Scott Wagner and Rep. Mike Kelly, whose district is considered competitive by House prognosticators but not among the most likely to flip to Democrats. Below the radar, Trump may also have provided a boost for New York Rep. Chris Collins, according to Michael Caputo, who worked on Trump's 2016 campaign and is a longtime GOP political operative. "Being an hour plus away from Buffalo, New York, is like being in western New York," Caputo said, adding that there were "carloads of Trump supporters" making the trek from the Buffalo area to Erie. Trump would probably stay away from western New York because Collins is under indictment, Caputo added. The president has mostly been to states with competitive Senate races, including Montana, Missouri, Tennessee, West Virginia and Mississippi, where Sen. Cindy Hyde-Smith needed a bump in her effort to tamp down support for another Republican, State Sen. Chris McDaniel, in the state's open primary. Trump held a rally in Indiana in late August, and he visited North Dakota in early September to help Rep. Kevin Cramer in his effort to unseat Democratic Sen. Heidi Heitkamp — though he didn't stage a rally there. Increasingly, Trump is campaigning in areas with tight House races. But those visits comprise a relative handful of the competitive House elections, and he is largely staying in Republican-heavy pockets of those districts. The night before his Erie appearance Trump spoke in Council Bluffs, Iowa, the district of Rep. David Young, who is locked in a tough re-election battle. Reps. Rod Blum, from farther east in Iowa, and Don Bacon from neighboring Omaha, Nebraska, attended. Most of the crowd in Pottawattamie County — where Trump beat Clinton, 57 percent to 36 percent — had driven in from Nebraska. On Friday night, Trump traveled to Lebanon, Ohio, which is in a far corner of Rep. Steve Chabot's Cincinnati-based 1st District. The fundraiser he held before the rally was an indication of the way he may be most helpful to House candidates: helping to line their treasuries with campaign funds in the final stretch before the election. Overall, Trump's campaign trips have taken him to media markets that touch on about 20 competitive House districts, a fraction of the more than 100 that the Cook Political Report rates as having the potential to flip from one party to the other. In many districts, the president could be more of a hindrance than a help to Republican candidates. So far, he hasn't campaigned in New Jersey, where there are four House seats that could flip into Democratic hands. One of them is the re-election bid of Rep. Leonard Lance, a Republican who represents the Bedminster golf course where Trump spends many of his weekends. But Lance, who has distanced himself from the president on immigration, taxes and other issues, told NBC News earlier this year that he wasn't interested in having Trump campaign for him. Trump is planning a western campaign swing this week to Missoula, Montana; Mesa, Arizona; and Elko, Nevada, all of which have competitive Senate races. Republicans are trying to flip two Democratic-held House seats in Nevada — the 3rd and 4th districts — but Elko is outside of them, meaning he is less likely to antagonize Democrats in those districts with his presence. Trump won Elko County with more than 70 percent of the vote in 2016. Likewise, Trump will avoid Arizona's 2nd District, where Democrats are trying to take the seat of Rep. Martha McSally, the GOP Senate candidate, instead holding his rally near the district of Rep. David Schweikert, who is regarded as having a good shot to win re-election. It's the Montana leg of the trip that stands out, though. That's because Trump lost Missoula County, 52 percent to 37 percent. With a little more than three weeks left before the midterms, it remains to be seen whether that spot is an anomaly on the map or a sign that he's willing to test his message out on less friendly terrain.